Today's post written by Steven Diatz, who portrayes Mr. Armitage, our esteemed Purser. 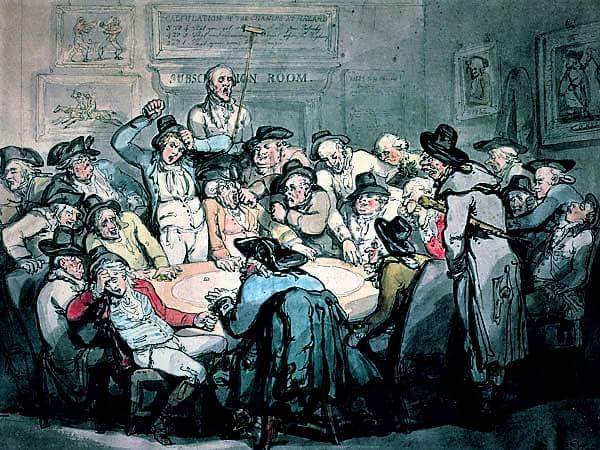 I would have it known my gambling forays are mostly limited to on-shore locales, such as decent taverns, gaming clubs, and balls and soirees (that I have been invited), and only with like-minded gentlemen and lady gamesters. Aside form the occasional entertaining odd hand at whist, or dicing (for low stakes), with my fellow warrants and lieutenants, in the Acasta wardroom, I would never use my acumen, at the 'green table' against any 'below decks' ratings, as many of them are already in-debted to me, as purser, and my 'pursers bank' (which I am permitted to operate, and which some of my wardroom 'brothers' have utilized, when in need of cash or credit). I maintain that I play strictly 'upon the square', upon my honour. I gained some skill, at play, when (in my youth), I frequented some notable London 'gaming hells'. I developed the expertise of procuring wholesome victuals and (later on) sturdy clothing, while employed at various London merchant grocers, with a long stint at the prosperous firm of Fortnum and Mason (St James St, Piccadilly), and the counting house of Wm Giles and Company (Temple Bar). 'The Hazard Room'..above, drawn in 1792, by Mr Thomas Rowlandson. I developed the art of 'the barter', but always made sure of quality goods, at the best price, a credo I employ, as ship's purser. I have endeavoured to use my gambling winnings and purser's profit (which is not begrudged me, by regulations) to benefit our crew, by laying in a goodly supply of various 'greens' and dried fruit, to augment the ship's rations, which I bear, at my expense. Dr Roberts, our scholarly ship's surgeon (and 'man of science'), will atest, I believe, that the health, vitality and disposition of the Acasta crew has much improved, by this, which I had already discovered by conferring with other RN pursers. I long realized I do not have any great skill at seamanship or 'fighting tactics', but to properly feed and clothe our Acasta crew, using my experience and abilty, is the best way of 'serving King and Country'.